Hunsrück Ferienpark Hambachtal in Oberhambach - the best offers! Hunsrück Ferienpark Hambachtal is located near the towns of Trier and Bernkastel, in the beautiful Hunsrück-Hochwald National Park. This family park offers various facilities for young and old. 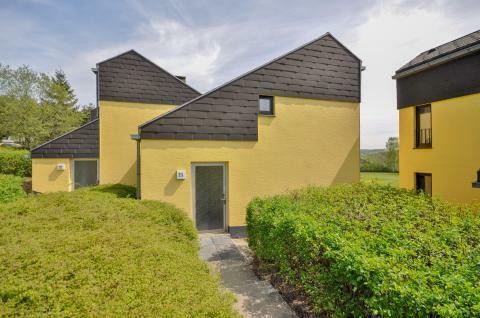 This price applies to 4-person cottage, with the arrival as 11 June 2019, 3 Nights. This price applies to 6-person cottage Comfort, with the arrival as 11 June 2019, 3 Nights. This price applies to 2-person apartment, with the arrival as 25 April 2019, 3 Nights. Pets are allowed in most accommodations. If you want to bring a pet, you must pay a €5 pet fee per pet, per night, and the final cleaning is obligatory. If you cannot add pets to your booking, there are unfortunately no accommodations allowing pets according to your specific choices. Hunsrück Ferienpark Hambachtal is in the beautiful Hunsrück-Hochwald National Park, the newest National Park in Germany. Not far from cities like Trier and Bernkastel on the Moselle River, it is a beautiful area with woods, hills, lakes and ruins. You can visit the old gemstone town of Idar-Oberstein, or admire the picture-book views on the hiking trails. 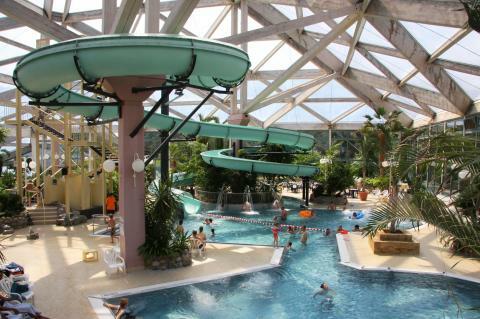 The park also offers many facilities, including a hammam and subtropical aquapark. 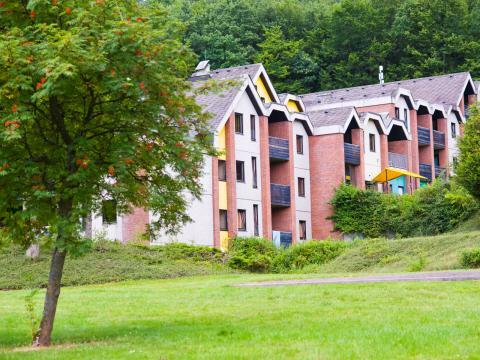 Sports enthusiasts will be delighted by Ferienpark Hambachtal. You can include tennis, table tennis and archery on your itinerary. There is a subtropical swimming pool with a super slide of 97m, a sports pool and a separate children’s pool. The park is situated in a beautifull hilly area, so some of the facilities are only accessible via stairs. Make sure you consider this when booking your stay. Hunsrück Ferienpark Hambachtal has many amenities aimed at children. They will have lots of fun in the subtropical indoor pool with several slides, as well as an extensive entertainment programme with craft activities and story hours. Hunsrück Ferienpark Hambachtal also boasts many dining options. There’s a buffet restaurant with a terrace where you can create the most delicious meals yourself. You can also dine à la carte at the restaurant of the park, or enjoy a drink at the bar. There’s also a supermarket at the park. The Hunsrück is a beautiful hilly area featuring the 816km high Erbeskopf Mountain. The area invites long walks and promises panoramic views. You can also visit Porta Nigra, the Roman city gate in the nearby city of Trier. If you are interested in tasting the famous Moselle wine, a day trip to the beautiful town of Bernkastel on the Moselle river is highly recommended. Companies can only stay on request at the holiday park. If your application is accepted by the park, then cleaning and linen charges are compulsory. Reservations can only be made by persons over 21 years. Pets are allowed in most accommodations. If you want to bring a pet, you must pay €5 per pet, per night, and the final cleaning costs are obligatory. If you cannot add pets to your booking, all accommodations allowing pets are unfortunately fully booked. The sauna and wellness facilities are only open on the weekends. In the main building you can use the WiFi for free. When you want to use WiFi in your accommodation, you will have to pay an extra fee.